The debt market was subdued in 2014. The Reserve Bank of India (RBI), in its December policy, did not change the repo rate. The rate was last revised in October 2013 when Governor Raghuram Rajan increased it by 50 basis points or bps to control inflation, which has come down substantially since then. The RBI, however, did indicate chances of a rate cut in early 2015 provided inflation falls further. Murthy Nagarajan, head, Fixed Income, Quantum AMC, says the RBI feels that a rate cut at this stage will be premature. It first wants to make sure that the fall in prices is durable, he says. Even though consumer price index (CPI) inflation is down from 10% in September 2013 to 6.5%, food inflation has been around 10% for the past five years. The RBI has lowered inflation projections for the next four-six quarters. "We expect CPI inflation to be close to 5.5-6% in the next two-three quarters and that may provide the central bank leeway for a more conducive monetary policy," says Rahul Goswami, CIO, Fixed Income, ICICI Prudential AMC. Goswami expects a 50 bps cut in the repo rate over the next two quarters. "Continued improvement in current account deficit and fiscal situations, moderation in CPI and oil at five-year low have led to a positive view on interest rates," he adds. 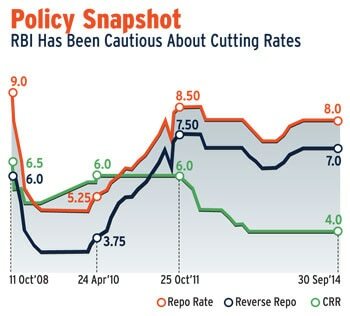 According to a Morgan Stanley report, the RBI is expected to follow a framework for keeping real rates (repo rate minus inflation) at 150-200 bps. If CPI inflation falls further due to oil prices, it expects the RBI to go for an additional rate cut of 50 bps, bringing the cumulative rate cut in 2015 to 100 bps. Impact on Bond Yields "Yields have fallen by 50-60 bps in the last three months due to falling crude oil, cereal and vegetable prices," says Nagarajan of Quantum AMC. He expects a cumulative cut of 100 bps in the coming year. The ten-year yield will remain at 7.75- 8% levels till the first rate cut in March, he says. This is good news for bond investors as interest rates and bond prices share an inverse relationship. Fall in interest rates and yields leads to a rise in bond prices and, hence, the net asset values of bond funds. That is why long-duration funds gave good returns in 2003-04 and 2009 when 10-year yields fell to 5%. Further, risk premiums, which were high for the last four-six quarters, have moderated of late, lowering yields. This is mainly on account of improvement in the current account deficit and the RBI's ability to shore up currency reserves. 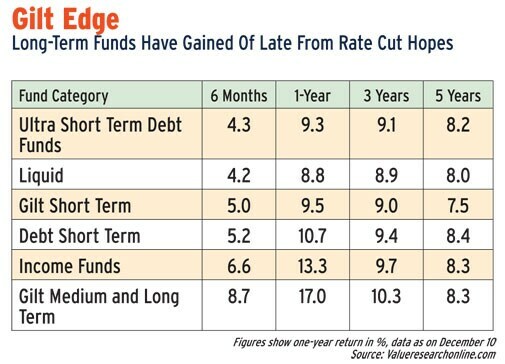 This is reflected in the performance of debt funds, with longer-duration funds like Gilt Long and Medium Term Funds and Income Funds giving double-digit returns in the last one year. Those who are risk-averse should invest in short-term funds over one year as improving liquidity may bring down short-term yields. Investors with a shorter horizon of less than six months can go for ultra short-term plans. Investors who have the capacity to hold on to their investments for one-three years should go for duration products to gain from the full extent of the fall in inflation and repo rate. "They should select income funds or gilt funds and not credit funds," says Nagarajan of Quantum. Inflation is expected to around 6% next year compared with 8% in 2014. Investors in debt funds can look at a 50 bps fall in rates in 2015 with ten-year G-secs expected to trade in the 7.25-7.50% range by the end of 2015 from 8% at present. That's why Goswami of ICICI Prudential continues to take long duration calls. We are also likely to see a fall in bank lending and deposit rates. "Deposit rates have already started softening. A cut in lending rates will follow as credit pick-up is much lower than projected," says Ashutosh Khajuria, president, treasury, Federal Bank. "A cut of even 25 bps will confirm the reversal of the rate cycle and may prompt industry to prepare for new projects; of course, the lag could be as much as three-six months," he says. He says those who understand debt markets can also invest in quality corporate bonds/debentures, which he says may give good capital gains as well as interest income. India's bond markets attracted record funds from foreign institutional investors, or FIIs, in 2014. The FIIs were attracted by high yields of more than 8% on 10-year bonds, much higher than that in the US (2.4%), Germany (0.8%) and Japan (0.5%). "The cumulative investment by FIIs in the debt market has been around $25 billion this year. It is likely to cross $30 billion by the end of the year," says Khajuria. "The changes in governance and policy corrections to boost industrial production and reforms to improve the ease of doing business in India will support capital inflows," he says. The cost of funds in developed markets is low, thanks to zero policy rates that investors there can use to invest in economies with higher interest rates such as India, says K P Jeewan, head, debt market, Karvy Stock Broking. Even on a hedged basis there is a 1.5-2% spread on account of the difference in rates. "Most flows, though, remain unhedged as the view on the currency is favourable. Any change in the currency outlook can quickly change the direction of flows and cause a scramble for hedging," says Jeewan. The Indian debt market has many things going for it. One, the price of oil, India's largest import, has fallen 30% this year. Our oil import bill was $155 billion last year. So, expect a sharp fall in the coming year, something that will help government finances. "The current account deficit for the current financial year is expected to be $40 billion, which can be covered by external commercial borrowings and foreign direct investment. FII money is the excess inflow," says Nagarajan of Quantum. There is also expectation of a 100 bps cut in the repo rate next year. Hence, FIIs are expected to gain from capital appreciation on bonds as well. 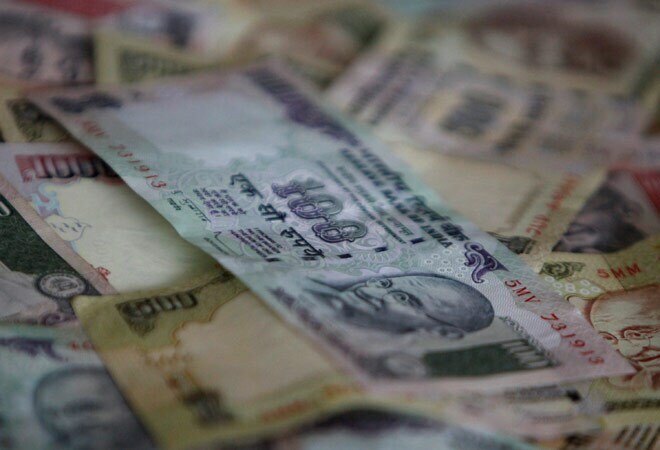 Further, the rupee is expected to be relatively stable due to low current account deficit in the coming years. "FIIs have been investing in debt markets on grounds of improving macroeconomic fundamentals backed by a stable political scenario, a trend that is likely to continue," says Goswami of ICICI Prudential. At present, the FII limit in government securities is $25 billion, which is fully utilised. The corporate bond limit is $51 billion. Half of this is still unutilised. "The demand from FIIs has driven the spread between AAA-rated and government securities to 20-30 bps from 60 bps three months ago," says Nagarajan. Quasi-government papers are trading at a spread of 3-10 basis points over government securities. Goswami of ICICI says past trends indicate low correlation between Indian and US bonds. "The market may have to absorb the monetary policy stance of 6.5governments in the West which could bring near-term headwinds. However, our long-term view on India being one of the biggest structural opportunities in the world remains intact," he adds. As the first phase of quantitative easing (QE) began in the US, 10-year yields fell from 4.62% in 2007 to 2.76% in 2011. In India, the 10-year yields rose from 7.95% to 8.33% during the period. Globally, the European Central Bank (ECB) is expected to follow an easy money policy as euro zone inflation was 0.4% in October, much lower than the target of 2%. "The ECB is expected to go for quantitative easing in the coming months to prevent euro zone from slipping into recession, which should keep bond yields artificially suppressed in the coming years," says Nagarajan of Quantum. The US economy, on the other hand, is rebounding due to QE programmes by the Federal Reserve. Unemployment rates there have fallen to 5.8%, below the 6% level targeted by the Fed. The personal consumption expenditure index, the gauge used to measure inflation, rose 1.3% for October, though it failed to reach the 2% target for 21 months in a row. The dollar index, which measures the strength of the dollar against a basket of currencies, is trading at 88.50, a three-year high. The Fed is expected to increase interest rates only if the consumption index comes to 2% levels. "Given the weak state of the world economy, and the slack in advanced economies around the world, the Fed is expected to increase rates only towards the end of the calendar year," says Nagarajan. Hence both the Fed and the ECB are expected to maintain easy monetary conditions for the next financial year. This should not affect our bond markets. "Ten-year US yields are at 2.3% levels and Indian ten-year yields are at 8%, a spread of 570 basis points, which looks attractive even after factoring in 3% depreciation of the rupee against the dollar," says Nagarajan. What could spoil the party for India's debt market is increase in prices of crude oil and commodities like gold and coal which could adversely affect the deficit situation and inflation. Also, according to Khajuria of Federal Bank, after the expected rate cuts in India, a good part of debt flows may be repatriated to the US, where rates are set to rise.